Sykes is quite a character. 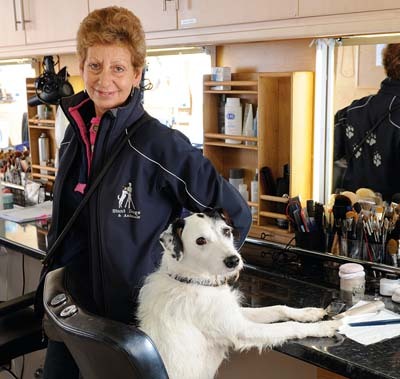 In fact, he’s many characters the seven-year-old terrier is a star of stage and screen. With a CV to rival the most successful of thespians, he’s been in films including The Other Boleyn Girl, The Young Victoria, The Duchess, Sweeney Todd: The Demon Barber of Fleet Street and Pirates of the Caribbean: The Curse of the Black Pearl. In the latter two, he worked with Johnny Depp and was once required to lick his face. On the small screen, Sykes’s show reel lists Casualty and Dalziel and Pascoe and he’s currently stealing his scenes in Midsomer Murders from Neil Dudgeon as DCI Barnaby. Most viewers will remember him from the Thinkbox adverts in which he played Harvey, who completed house-hold chores, such as mowing the lawn, stirring the supper, cleaning shoes and windows and driving the children to school, in order to persuade a young couple to adopt him. It was named advert of the year by ITV in 2010. During the course of filming, his owner, Gill Raddings, discovered to her amusement that ‘he’s far better at ironing from right to left than vice-versa’. She believes that Sykes can do ‘almost anything he puts his mind to’. His list of skills includes hiding his eyes, limping, shaking his head, dancing, playing dead and holding objects.